The VolatilityFactor2 MT4 EA is a forex expert advisor. The Volatility Factor2 automated forex trading software for the MetaTrader platform places trades for you. The VolatilityFactor2.com forex robot works with all brokers. Volatility Factor 2.0 PRO is an automated forex trading software (expert advisor). It is inheritor of the popular Volatility Factor EA. We've implemented our sensational "Broker Spy Module" – it is a game-changing tool and traders from all over the world just love it. We spent over 2000 hours in developing and refining this powerful tool with one primary goal - to protect your capital and you from unethical brokers: cheating you with high negative slippage, high spreads or delayed order execution. Now you will be able to monitor every minute whether your broker is stealing from you. Our "Broker Spy Module" have already saved hundreds of traders to be literally robed. Volatility Factor 2.0 is specialized EA designed to deliver 10-15+ pips per trade. It is based on a very powerful volatility-based market algorithm that has been put through a battery of real-world tests. It has passed every test and has an impressive win rate. This is how it works. Volatility Factor’s algorithm watches the market closely and initiates trades that capitalize on market volatility. Volatility Factor’s power comes from it lightning fast reaction and leveraging of the market’s direction. When Volatility Factor 2.0 sees a movement in one direction, most of the time it signals trades in the direction of the medium-term market impulse. It uses powerful and sensitive money management rules to guard risk on the trade until it is exited. With leverage, returns on this strategy are magnified. Volatility Factor 2.0 also takes advantage of pricing oscillations around a prevailing price point, continuing to deposit gains in your trading account. Volatility Factor 2.0 uses an aggressive strategy for leveraging small investments and turning them into large profitable windfalls. It requires excellent timing and sophisticated analysis. Volatility Factor 2.0 takes all of the work out of your hands and gives you simple, easy-to-understand signals for successfully trading the market. As you know, it’s impossible to eliminate risk. However, we can minimize your risk profile. Volatility Factor 2.0 allows you to precisely calibrate your risk settings to maximize your profit. Volatility Factor 2.0 takes money management one step further by closely monitoring your open trading positions during the session. Using proprietary exit logic, Volatility Factor 2.0 will close out each trading position at its OPTIMAL level. Risk-level settings plus sophisticated drawdown monitoring makes Volatility Factor a low-risk trading partner. Our team has packed Volatility Factor 2.0 with everything you need to professionally trade the currency markets. We’ve left nothing to chance. You'll be pleasantly surprised by how much you will be able to do with Volatility Factor 2.0 PRO. I am using Volatility Factor 2.0 Pro for almost 3 months. The results for this period of time are excellent. 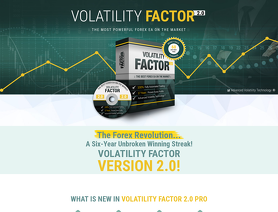 I recommend Volatility Factor 2.0 Pro to all forex traders who want secure and profitable trading strategy. The support is also very good. The support team responses quickly and with solution to all problems. This review came from the same location used by the representative of Volatility Factor 2.